A very short, very simple quest which adds a lore-friendly travel route between Vvardenfell and Mournhold. Please see the readme (or the main file description on the main page). Elder Scrolls Forum: I go by the name "HangHimHigher", and you can message me via that name. Please feel free to contact me with any questions, bugs, typos, suggestions for improvement or any other feedback on the mod! If you're like me and you play with some sort of "Delayed Dark Brotherhood attacks" mod, you may come across an issue: if you have to wait for the Dark Brotherhood attacks before Asciene Rane will talk to you, how can you get to Mournhold before that? This mod adds a very short, very simple quest which will give you a lore friendly way of travelling to and from Mournhold whenever you like. The quest requires no combat, and so is available to players of any level. At the end of the quest, you may also receive a balanced teleportation item which lets you travel between the different Mages Guilds of Vvardenfell too. The mod also gives Folms Mirel a personality (via new dialogue). To start the quest, ask around for rumours at Caldera. Or, if you're impatient, just go and talk to Folms Mirel at the Caldera Mages Guild. The mod has been cleaned with TESAME and TES3CMD. - Two basic dialogue fixes (including the one where Mages Guild members would refer to Folms as being in their guildhall even when they were not in Caldera). A final tweak to actually give Athal Mirel the ability to send you back to Vvardenfell, which I for some completely stupid reason left out previously. This mod requires the Tribunal expansion only. Before you install it, you need to choose which .esp file you would like to use. Version a - This is the basic mod. Version b - Use this version ONLY if you also use the lovely 'Excellent Magic Sounds' mod. Choose which .esp file you would like to use. You should not under any circumstances try to use both at once. Install the mod by copying all of the folders in the 'Data Files' directory, including the .esp file which you have chosen, paste them into your Morrowind Data Files directory of choice, and activate the .esp file prior to playing. As always, I haven't tested adding this mod to existing save files. It shouldn't cause any problems, but you may want to back up your save file just in case, if you're planning on adding the mod in. Mods which involve killing or altering Folms Mirel will likely conflict with this mod. 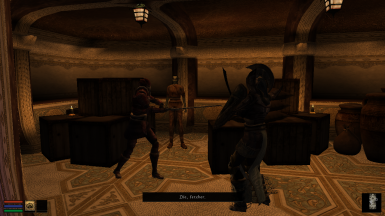 The only mod I'm aware of which might do this is Rise of House Telvanni, but a quick look through that mod's CS profile shows that they don't actually alter Folms Mirel at all. So, you should be able play this mod along with Rise of House Telvanni as long as you finish the quest before Rise of House Telvanni moves/kills Folms Mirel, and all will be well. Other mods which add new greetings to Folms Mirel may conflict because this mod gives Folms Mirel new greetings which may block theirs. For example, 'Proprylons' by Stuporstar and CDCooley also adds greetings to Folms Mirel which are blocked by this mod's new greetings. 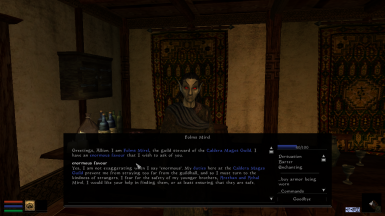 To get around this: finish the quest Folms Mirel gives you as part of this mod. Once you have done this, Folms will have a 50% chance of greeting you with a message added by this mod, and a 50% chance of just saying whatever other mods/the vanilla game want him to say, so if you just keep talking to him again and again, you should be able to get any other greetings which were previously being blocked. At some point in the (distant) future, Tamriel Rebuilt may conflict with this mod, as I hear they've got big, exciting plans for vanilla Mournhold! If LGNPC ever gets to Caldera, there will probably be a conflict with Folms Mirel. The only resources I have made use of in this mod are those from Arcimaestro Antares' Animated Morrowind V1. Please don't use any meshes, textures or sounds from this mod package -- if you would like to use something included here, please download Animated Morrowind V1 and use the resources directly from there. Unless for some reason you count my scripts as resources, in which case, go ahead and use them! a) don't change anything; i.e. upload the archive exactly as you downloaded it with all files and the readme present. c) don't charge anyone money for it. Just generally please don't do mean things. a) Make translations of this mod freely, no need to contact me. Though it would be nice if you did, just because it would be cool! b) Make patches for this mod and any other mod you like. Again, no need to contact me, though it would be nice if you did so that I could link to the patches myself as well. I've tried my best to make this mod safe to use, but I can't take responsibility for any adverse effect which comes from you downloading and/or playing this mod. Arcimaestro Antares: For the lovely NPC sweeping animations and associated resources. nakakita: For spotting some dialogue issues and conflicts in the mod. Bethesda: For the only game that's ever gotten me hooked. You: For being interested enough to read this far.